However, when I was in my early twenties, I hadn't yet gotten clarity on exactly how I might spend the next 30 to 50 years of my life. More than three decades after my first awkward conversation with a financial professional, I've learned that I am (relatively) normal. In “The End Of History Illusion And The Problem With Goals-Based Investing,” Michael Kitces, Partner and the Director of Research for Pinnacle Advisory Group, and publisher of the financial planning industry blog Nerd’s Eye View, says research suggests that “we don’t really have any real clue what our goals actually are” so it makes sense to plan for a flexible future. Interestingly, that's what I've been doing all along. Experts suggest saving as much as six months' salary and setting that money aside in a safe place, like an FDIC-insured savings account. The particulars of an emergency fund (aka safety net or opportunity fund) may vary with the individual or family.For example, if I own my home outright (no mortgage), grow my own food, and live in walking distance of neighborhood amenities, then I may need less than someone with a large mortgage and car loans. There's nothing right or wrong about either scenario, but one will demand more cash if I experienced a sudden loss of income. I periodically evaluate my circumstances, determine how much to hold in cash, and then set that dollar amount as a financial goal. Another big goal is the elimination of consumer-type debt, such as credit card debt or car loans. In the past, I didn't rush to wipe out my debt but I worked steadily toward paying off balances. As odd (and obvious) as this statement may sound, eliminating debt goes a long way toward helping achieve other financial goals. I can divert dollars from debt to wealth building, either through saving or investing. There's disagreement among some financial experts in regard to mortgage debt. Some say that it should be eliminated while others argue that having a low fixed interest rate could be sustainable (and desirable) even into retirement. Personally, I decided to get rid of this debt. Arriving at mortgage-free status was a goal that I achieved. It's not exciting but it was useful to eliminate this payment from my day-to-day expenses. I have greater financial flexibility as a result. At some point in my life, I'll likely retire, either because I want to stop working or need to stop working. Having money designated for retirement gives me the funds to pay my regular bills plus possibly allow me some luxuries. Now, there are many ways to save money for retirement or develop streams of income that will support my retirement. For example, I may receive Social Security benefits, government or private pension benefits, income from rental properties or a business, royalties on an invention or creative work, or distributions from a retirement account such as an IRA. Certainly, I may continue doing work I love like Oliver Smithies, a Nobel Prize winning scientist who continued to work in his lab well past typical retirement age. But I'll want to have retirement funds that gives me the freedom to pursue professional or personal interests in my 70s, 80s, and beyond. And since I'm saving and investing within a designated retirement account such as a Roth IRA, Traditional IRA, 401(k) plan, or Roth 401(k) plan, then my money will grow tax-free during my working years. Protect myself from major loss. One of my financial goals is to protect my family from major losses, such as the destruction of our home, the death of a breadwinner, or a serious, costly illness. So, getting some form of life insurance, health insurance, and homeowner's or renter's insurance has always been on my must-do list. Save money for my children's education. I didn't save as much as I would have liked, but I did save some money for my children's education. When the time has come to pay these expenses, I'm happy to draw from these accounts to cover any shortfalls between my discretionary income and tuition bills. Fortunately, striving toward these goals all work together. If I have an emergency fund, for example, then I'll be less likely to put a major bill on a credit card and pay high interest rates on the balance for several months or years. If I've eliminated debt, then I'll have discretionary income to save for my retirement and my children's education. Now, I could and probably should have financial goals in addition to this list. For example, I may want to save and invest enough to launch a business, leave a legacy (either by giving an inheritance to my children or being remembered for charitable gifts), or enjoy a hobby (perhaps sailing or cycling) to its fullest. 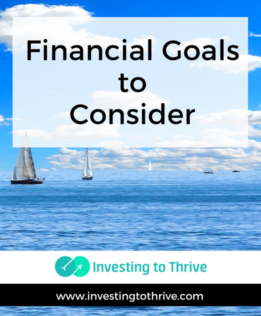 But having these basic goals – saving for an emergency, eliminating debt, saving for retirement, protecting my family, and saving for my children's future – have helped me establish the foundation for fulfilling future (and ever-changing) dreams.